So this isn’t an illustration project, but something else a little bit creative I worked on last week: customizing a dress I picked up at work. Here’s what I started with: Cute, but kind of plain. Plus, a bit see-through. 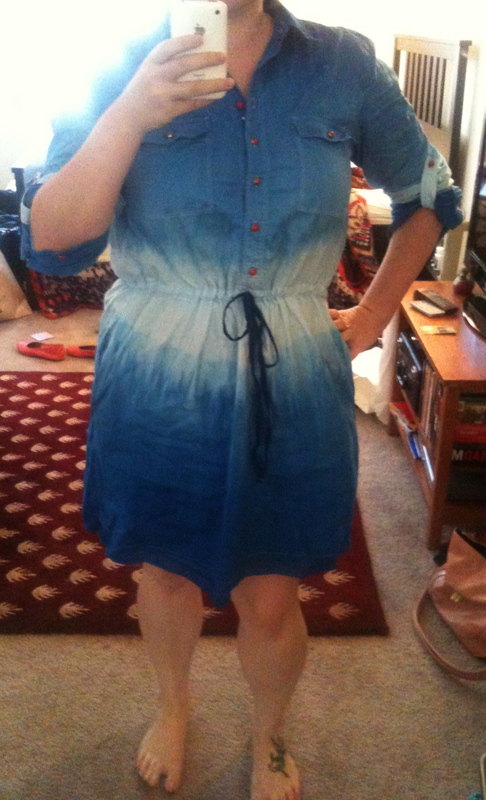 But, I thought, it has a nice cut, I’ve been looking for a shirtdress, and it’s only $35 with my employee discount. I can make this work. Mom, if you recognize the pot I’m using… it got bent, and now the lid doesn’t fit. So I’m not ruining it, I’m giving it a second life. 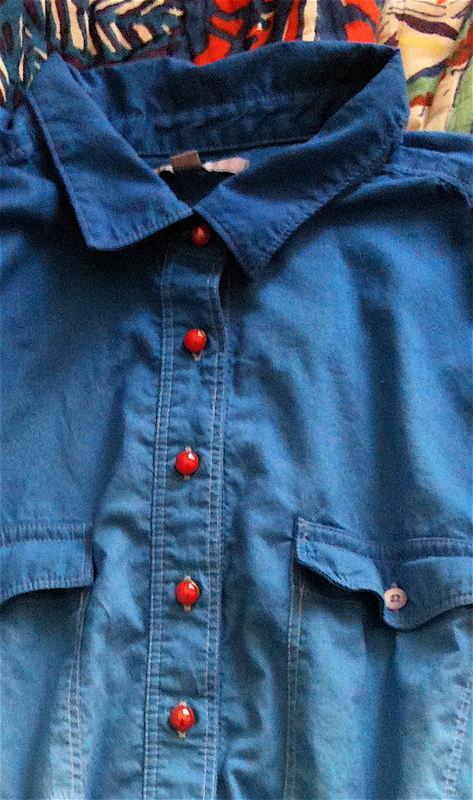 I had a vision in my head of what I wanted, and gathered the necessary supplies: fabric dye and new buttons. A few days later, at the witching hour, I started working. I knew I wanted an ombré effect that faded as it reached the center of the dress, with the waist tie dyed dark like the top and bottom of the dress. 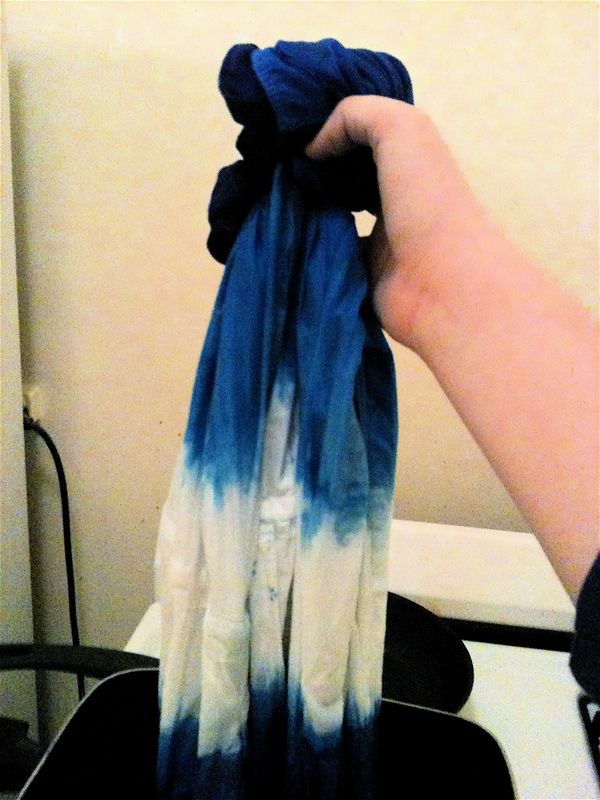 To achieve the effect, I rinsed the fabric to make it damp (always a good idea for even color distribution! ), then started dipping the fabric in the prepared dye solution. I dipped it about as far as I wanted the color to reach, then pulled it back about halfway out; the ends of the fabric thus stayed in the solution longer and absorbed more of the pigment. You can see at the top of the second photo how some of the wadded up fabric is darker, some lighter. Exactly how I wanted it! To prevent any unsightly drips, I dyed the top first, rinsed it out until the water ran clear (which, believe me, took a lot of rinsing), then went back and dyed the bottom. 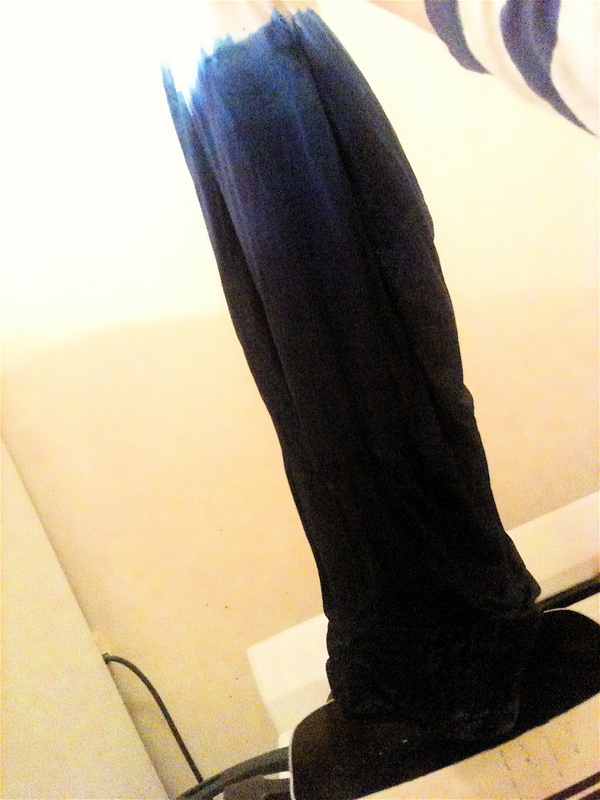 I let the dress sit overnight (rolled up in a towel like the world’s skinniest dead body) and tossed it in the wash the next morning. And here’s the end result! Pretty nice, right? The ombré effect isn’t as smooth as I would like, and there are a few “tie-dye” type water marks, but overall It’s pretty awesome. Next step: buttons. I didn’t notice it until I removed them, but the original buttons were dip-dyed too! A close-up of the buttons. And the result! Yes, I totally have already worn the dress to work to garner the praise of my coworkers, how did you know? I’ve been itching to do this with a friend of mine. Thanks for the inspiration. Your dress looks great! I say go for it! The hardest part was focusing on taking pictures without dripping dye all over the kitchen, haha! Reblogged this on Indonesian Great Content. Hello. You’ve been award an award. I’m not sure what award but i was awarded now i’m passing it on. 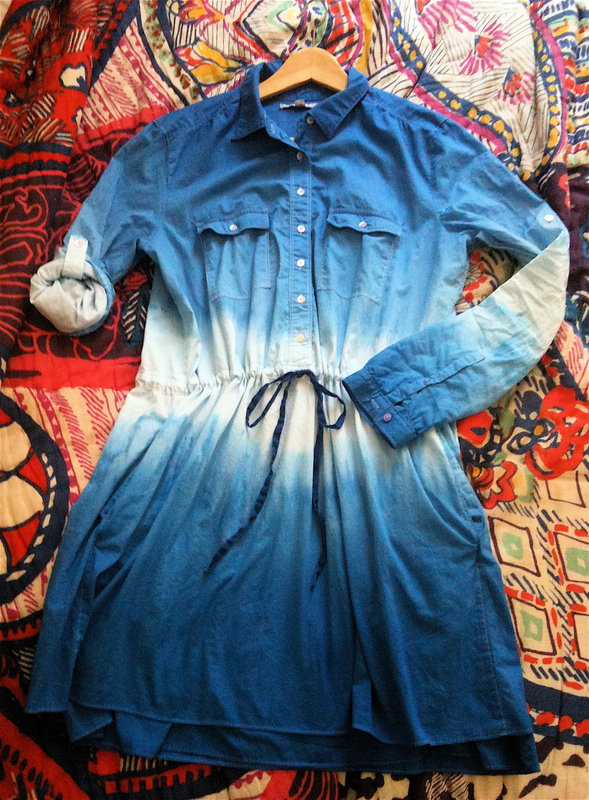 Wow, the dress looks stunning O: Those original buttons are sort of cute, haha ! You might use them for something else someday!